Dr. Simms grew up in Wolfville, N.S. and graduated, with a BSc. (honors biology), from Acadia University in 1973. For three summers, while attending veterinary school, Sandra worked as a student assistant for Cornwallis Veterinarians Ltd. 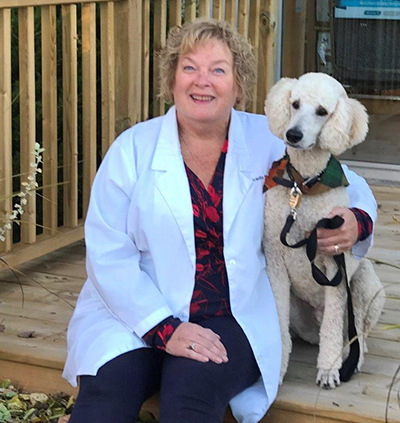 Following graduation from the Ontario Veterinary College, University of Guelph in 1977 Dr. Simms spent a year doing veterinary locum work in the UK. Upon returning to N.S. she worked for Dr. Ross Ainslie in Halifax before returning to Cornwallis Veterinarians Ltd. in December, 1978. Along with her husband, Dr. Randall Bishop, Dr. Simms became a director of Cornwallis Veterinarians Ltd. in 1981. She worked full time and then part time following the birth of their second of four children. In 2004 Dr. Simms sold her partnership in CVL but still enjoys veterinary practice on a part time basis. Dr. Simms enjoys small animal medicine and surgery and is also a veterinary consultant for the Animal Care Facility at Acadia University. In 2008 Dr. Simms volunteered at a spay/neuter clinic in Mexico sponsored by P.E.A.C.E. Mexico which was an extremely rewarding experience and in 2015 along with her 4 children and 2 of their significant others she hiked the Inca Trail (4000meters elevation) to Machu Pichu. Outside of her family, this was one of her hardest and most rewarding life experiences! She enjoys hiking and snowshoeing with her Standard Poodle Stella, summer cottage activities, travelling, ballroom dancing, gardening and of course her grandchildren!